Edinson Cavani scored a hat-trick as champions Paris St-Germain set a new record points total in Ligue 1 after an easy win against Ajaccio in Corsica. Laurent Blanc's runaway leaders moved on to 92 points with two games of the 38-match season remaining. Uruguay forward Cavani, 29, broke the deadlock with a perfectly placed header before his clinical finish made it 2-0. He completed his hat-trick with another header before Zlatan Ibrahimovic completed the rout in stoppage time. The win keeps PSG 27 points clear of nearest rivals Lyon, who thrashed third-placed Monaco 6-1 and have played one game more. Forward Alexandre Lacazette scored a hat-trick for Lyon, while former Newcastle United defender Mapou Yanga-Mbiwa got two and midfielder Rachid Ghezzal also found the net. PSG's last two league games are away to mid-table Bordeaux on Wednesday before they host Nantes on 14 May. Blanc's side, who have also won the French League Cup, meet Marseille in the Coupe de France final on 21 May. Match ends, GFC Ajaccio 0, Paris Saint Germain 4. Second Half ends, GFC Ajaccio 0, Paris Saint Germain 4. Goal! 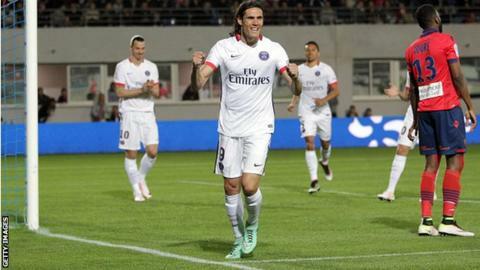 GFC Ajaccio 0, Paris Saint Germain 4. Zlatan Ibrahimovic (Paris Saint Germain) right footed shot from outside the box to the bottom left corner. Assisted by Maxwell with a through ball. Attempt missed. Khalid Boutaib (GFC Ajaccio) header from the centre of the box is close, but misses to the right. Assisted by Issiaga Sylla with a cross. Attempt blocked. Khalid Boutaib (GFC Ajaccio) right footed shot from the centre of the box is blocked. Assisted by Jacques Zoua. Foul by Jean-Kevin Augustin (Paris Saint Germain). Pablo Martinez (GFC Ajaccio) wins a free kick in the attacking half. Attempt missed. Kévin Mayi (GFC Ajaccio) left footed shot from outside the box is too high. Assisted by Jacques Zoua. Offside, GFC Ajaccio. Pablo Martinez tries a through ball, but Khalid Boutaib is caught offside. Substitution, GFC Ajaccio. Amos Youga replaces David Ducourtioux. Foul by Damjan Djokovic (GFC Ajaccio). Attempt missed. Marquinhos (Paris Saint Germain) header from the centre of the box misses to the left. Assisted by Lucas Moura with a cross following a corner. Corner, Paris Saint Germain. Conceded by Kader Mangane. Attempt saved. Lucas Moura (Paris Saint Germain) right footed shot from the centre of the box is saved in the centre of the goal. Khalid Boutaib (GFC Ajaccio) wins a free kick in the attacking half. Delay in match (GFC Ajaccio). Substitution, Paris Saint Germain. Maxwell replaces Christopher Nkunku. Substitution, Paris Saint Germain. Jean-Kevin Augustin replaces Ángel Di María. Kader Mangane (GFC Ajaccio) is shown the yellow card for a bad foul. Lucas Moura (Paris Saint Germain) wins a free kick on the right wing. Foul by Kader Mangane (GFC Ajaccio). Substitution, GFC Ajaccio. Kévin Mayi replaces Alassane Toure. Delay in match Roderic Filippi (GFC Ajaccio) because of an injury. Offside, GFC Ajaccio. Alexandre Coeff tries a through ball, but Khalid Boutaib is caught offside. Attempt blocked. Khalid Boutaib (GFC Ajaccio) right footed shot from outside the box is blocked. Assisted by Jacques Zoua. Attempt blocked. Alexandre Coeff (GFC Ajaccio) left footed shot from the centre of the box is blocked. Corner, GFC Ajaccio. Conceded by Marquinhos. Substitution, Paris Saint Germain. Lucas Moura replaces Edinson Cavani. Goal! GFC Ajaccio 0, Paris Saint Germain 3. Edinson Cavani (Paris Saint Germain) header from very close range to the bottom left corner. Assisted by Layvin Kurzawa with a cross. Substitution, GFC Ajaccio. Damjan Djokovic replaces Jerome Le Moigne. Issiaga Sylla (GFC Ajaccio) wins a free kick in the defensive half. Offside, Paris Saint Germain. Christopher Nkunku tries a through ball, but Ángel Di María is caught offside.